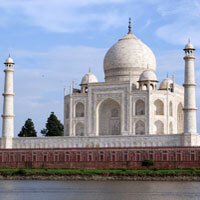 Golden Triangle with Varanasi (Ganges) Tour is a much sought after India tour. 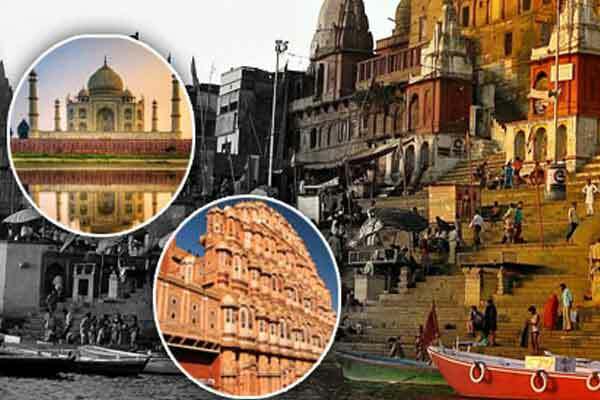 Though a visit of Delhi, Jaipur and Agra unfolds various aspects of local cultures and plenty of world famous monuments but Varanasi tour is a visit to cultural capital of India. Varanasi, known as Banaras & Kashi, is world’s oldest living city. Enveloped in ethereal spirituality, Varanasi charms tourists from across the globe for the Ganges, yoga, Ganga ghats, numerous temples, incredibly Indian lifestyle, Sarnath and cultural uniqueness. Probably, Golden Triangle with Varanasi (Ganges) Tour is the most compact India tour to represent north Indian ethos. Another fascinating aspect of this tour is experiential journey into Indian rail. Qutub Mina is also a major tourist destination of Delhi, as well as India. Construction of Qutub Minar, a tower, begun in 1199 by the first sultan, completed by his successor and partially restored in the fourteenth century. Standing 238 feet high, it is built of subtly graded sandstone and marble, the colours ranging from dark red at the base, through shades of pink, to glowing orange at the summit. At the foot of the tower stands India's first mosque, erected over the foundations of a Hindu temple. Two sixteenth century structures that have survived the years are the mausoleum of Humayun, erected in his memory by his widow, and the Purana Qila, a massive fort (occupying the site of prehistoric Delhi) that contains both a mosque and a library. Post independence structures of Lotus Temple (belonging to Bahai faith) and Akshardham Temple (belonging to Swaminarayan sect of Hindu religion) are highly visited cultural centres with exquisite architectural specimens. After visiting New Delhi, return to Delhi hotel for overnight stay. Having taken sumptuous breakfast at Jaipur hotel, you will be driven to Agra. For Abhaneri, you have to take a detour of 7 kms about 95 kms from Jaipur. The sleepy village of Abhaneri is famous for ancient temple of a goddess. The temple of Abhaneri displays ruins and pieces of sculpture of a high degree of craftsmanship. But, now-a-days, the prime tourist attraction is 10th century Baoris (step-well) which is the most fascinating one in Rajasthan. The well is an innovative and indigenous invention of the local people to collect and harvest rainwater. 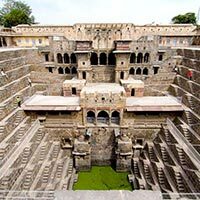 Abhaneri step-well has 13 levels and is fortified with flights of steps on the three sides. It is an interesting piece of architecture. Having seen Abhaneri, continue to drive for Agra. On the way to Agra, about 40 kms before Agra, there is a deserted town of Fatehpur Sikri, now a derelict village. 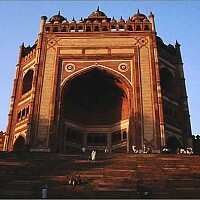 Fatehpur Sikri was the first attempt by the Mughal to build a planned township. Fatehpur Sikri was built by Akbar as twin city of Agra but with structured layout. Fatehpur Sikri is home to large palatial buildings like Jama Masjid, shrine of Salim Chishti, Buland Darwaja, Jodhabai Mahal, Panch Mahal etc. After visiting Fatehpur Sikri, proceed for Agra. There had been a settlement in Agra long before Babur made it his capital. It was Akbar who built the Agra Fort (which is still known as Akbarabad). On arrival at Agra, you will be received by the representative of Optima India Tourism and taken to Agra hotel for leisurely overnight stay. After visiting Agra Fort and having delicious lunch in a city restaurant, move on for visiting tomb of It-Mad-ud-Daula (known as Baby Taj) and tomb of Akbar at Sikandara. Later in the evening, you will be transferred to Agra railway station to board train for Varanasi. After overnight train journey from Agra, you will arrive at Varanasi in the morning. Representative of Optima India Tourism will receive you and take you to the Varanasi hotel. Relax, refresh and have delicious breakfast in Varanasi hotel. Varanasi, situated on the banks of holy river Ganga, is spiritual capital of India. Varanasi is often called as the "city of light (Kashi)". The light is symbolic of knowledge. Varanasi has been since centuries been a prominent seat of ancient learning. Though Varanasi is very pious to the Hindus, it (Sarnath) also is an important pilgrimage of the Buddhists. The 07th day of Golden Triangle with Varanasi (Ganges) Tour will ensure your visit of Sarnath where you will see remnants of Buddhist monastery, various stupas, well-kept museum and Tibetan Buddhist monastery. Sarnath is a shrine as holy to the Buddhist as Varanasi is to Hindus, for it was here that the Buddha preached his first sermon, expounding the eight-fold path that must lead ultimately to enlightenment and nirvana. It was only recently that the treasures of Sarnath were unearthed, although it had always been known to be the site of the famous Deer Park, where the Buddha preached that first, world-shaking sermon and where, in the seventh century, the Chinese pilgrim Hsuan-tsang recorded that there was a monastery large enough to house fifteen hundred monks. However, after the twelfth century, Sarnath was ravaged and plundered by Muslim invaders with religiously imbued hatred. Sarnath's degradation was complete and remained so until the mid-nineteenth century, when excavation was begun and continued, under the impetus of Lord Curzon, in the twentieth. Now there is a splendid museum to house the Sarnath finds, which comprise some of India's greatest treasures, including the famous lion capital that became the symbol of independence. After sightseeing tour of Sarnath, you will be driven to the ghats of Varanasi, stepped embankments on the western bank of river Ganga. Every evening a mesmerizingly enchanting "Ganga Aarti" (Worship Ceremony of the Ganges) takes place with religious piousness. The worship ceremony of the Ganges is depiction of inveterate reverence of the Hindus for river Ganga, treated as mother. Watch and experience the exotic aspects of Indian culture. 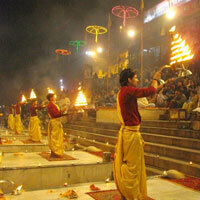 After viewing Ganges worship ceremony at the ghat, return to Varanasi hotel for overnight stay. The morning in Varanasi will unfold numerous exotic aspects of India and more particularly Varanasi. To acquaint you with the traditional and perennial Varanasi, you will be taken to the Varanasi ghat in the dawn-hours. A long boat-ride alongside the various ghats of the Ganges will be carried out. Early in the morning, proceed for viewing the panoramic view of ghats on boat. 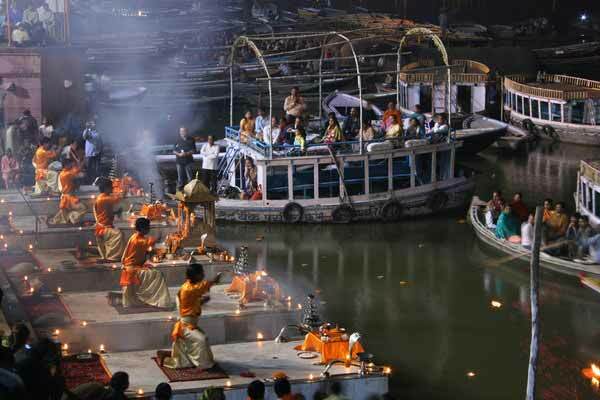 Ghats, embankments of long flights of wide stone steps on river Ganges, add a divine charm to Varanasi due to various activities like bathing, cremating, religious rituals, worshipping, commercial activities, ablution to work-out, astrologers under their palm leaf parasols etc are performed. Viewing the Ghats from a boat on the Ganges, especially at sunrise, is an unforgettable experience! After visiting ghats, return to your Varanasi hotel. Get refreshed, relax and have delicious breakfast. Thereafter, proceed to visit famous temples of Varanasi. Though the temples of Varanasi are very famous and garner unfathomable faith but their antiquity is not as old as is claimed. Though the city of Varanasi is one of the oldest living city of the world but the temples are not as old. The ancient temples were razed by the Muslim invaders out of religious zeal and hatred, so the existing temples can be considered as of newer origin. The holy temples of Varanasi are amongst the most visited temples in India. Situated on the banks of holy river Ganges, Varanasi temples add to the religious value to Ganges. The famous temples of Varanasi are Kashi Vishwanath temple, Durga temple, Sankat Mochan temple, Tulsi Manas temple and New Vishwanath temple. Also visit Benares Hindu University (B.H.U.). Tulsi Manas temple, built in 1964, stands adjacent to Durga Temple. The Tulsi Manas temple, dedicated to Lord Rama, is situated at the place where great poet and seer Tulsidas lived and wrote the great epic "Shri Ram Charit Manas". After completing the sightseeing tour of Varanasi, drive to Varanasi airport to board flight for Delhi. On arrival at Delhi airport, internally change the terminal to board international flight for your onward destination. 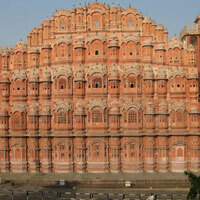 Jaipur, known as Pink City of Rajasthan, is the capital of the state of Rajasthan. Only two hundred and half centuries ago, the great Maharaja Jai Singh founded the capital city of Jaipur. It was a time when the Mughal power was waning and the Hindu Rajput rulers were asserting themselves. So, it was that Jai Singh II, living at the old Rajput capital of Amber, decided to found a new city in the nearby valley. He laid out his own capital in neat squares, with its wide main streets crossing each other geometrically. Having seen Jaipur, every traveler gets amazed at how orderly it seemed, rather as though it was the product of some twentieth century town planner. Contributing to this general impression is the fact that all the buildings were constructed of local pink stone, which earned for Jaipur its old designation of "the autumn sunset city". About 95 kms before Jaipur, is located a historical village of Abhaneri. This village tour will present before you ancient lineage of India in terms of cultural values, architectural gems and traditional rural lifestyle in villages of India. A detour is well merited for its amazing step-well or 'baoris' and Harshat Mata Temple. The village's original name was Abha Nagri and its present name is Abhaneri. Gurjar king Mihir Bhoja ruled over the Gurjar kingdom in the ninth century AD. The ruins of the temple also speak of the 10th century architectural and sculptural styles. There is a huge tank named "Chand Baori", opposite to the temple fortified on all four sides with bastions for defence. Even though Abhaneri is now in ruins, the place has a distinct reminiscence about itself. Varanasi, the cultural capital of India, is the Vatican City of the Hindus. Varanasi is known as the city of Lord Shiva and spiritual capital of India. It is situated on the banks of holy river the Ganges with history dates back to pre-historic times. One of the major pilgrimage destinations for Hindus since ages, Varanasi is one of the oldest living cities of the world. Though home to numerous Ashrams, Ghats, temples, stupas and various religious sects, Varanasi has been since ages a major commercial centre as well. Varanasi, the cultural capital of India, is a seat of learning since more than 3000 years of recorded history. Total night stays: 07 (Delhi-02; Jaipur-02; Agra-01; Overnight Train: 01; Varanasi-01). Morning boat cruise in the Ganges alongside Varanasi ghats. Train tickets for the overnight train journey in air-conditioned coach. Visit and exploration of narrow alleys, humming with social activities, while riding on man-pulled tri-cycle rickshaw. Ride a caparisoned elephant like a king at Amber Fort in Jaipur. Tonga (horse carriage) ride in Agra- from hotel to Taj Mahal gate. Morning boat ride in the Ganges along the ghats of Varanasi. Experience Indian hospitality in a comforting cocoon of a heritage hotel in Jaipur. Cultural events, puppet shows and traditional dances at Ravindra Manch. Evening Aarti at Govind Dev Ji temple in Jaipur, Rajasthan. Do attend Ganga Aarti (Ganges Worship Ceremony) on Dashashwamedh ghat. Visit Tibetan Buddhist temple while visiting Sarnath. Delhi: Handlooms, handicrafts, stalls that sell products from all over India (Dilli Haat). Jaipur: Environment-friendly printed clothes, jewellery and ethnic goods. Jaipur:Dal, Baati, Lahsun Ki Chutney, Gatte ki Sabji, Bajre ki Roti, Kadhi. Delhi: Street foods/snacks like ‘tikki’, ‘chaat’, ‘Dahi Bhalla’, ‘pao bhaji’, ‘fruit chaat’, ‘rabdi faluda’. Agra:Biryani at Heeng ki Mandi. Prices shown are for payments made through normal bank transfer into our accounts. Please provide your passport details to Optima Travels Private Limited at least one month before travelling. Please note that if you do not provide your passport details, you may be denied entry to any Indian National Parks that are visited along this itinerary, or you may be charged a fee by the local government as passport details are now a requirement for entry into all national parks in India. Throughout the trip, we request that our hotels prepare rooms in time for our arrival, especially if we're arriving prior to normal check-in time. However this isn't always possible which means we won't be able to check-in immediately on arrival at some hotels. Instead, we can store our luggage and explore our new destination. In India normally the check in time in hotels is 02:00 PM and check out time in hotels is 10:00 AM. Items of personal nature like telephone calls, laundry, tips, hard/soft drink etc. Arenot included in the package.